One of the advantages of teaching at W&M is that the strengths of our faculty and students, along with our location in Williamsburg, enable us to provide all kinds of special course and other curricular opportunities to our students. Our twin commitments to academic excellence and the liberal arts mean that our faculty care about innovative teaching and that our students also expect it from us. And the remarkable abilities of our students mean that they are open and eager to participate in such opportunities. The College’s national reputation and its location in a major tourist town also help us draw interesting people to Williamsburg for visits. Some semesters in my course about the U.S. Congress, I’ve often brought six to eight chiefs of staffs to U.S. Senators to W&M as part of complex simulation exercises in which students present memos to the visiting staffer offering advice about how the relevant Senator should vote on an upcoming roll call. Other years, the College has made possible guest lectures to that class from prominent current and former members of Congress, including Rep. John Lewis, former House Speaker Thomas Foley, and former Senator Chuck Hagel. Every year, we also bring dozens of nationally renown scholars to Williamsburg to buttress the remarkable abilities of our faculty. This semester, I’ve organized a special class for students on the topic of party polarization in America, perhaps the most salient aspect of the current political process in Washington, based on recent commentary from pundits and even President Obama. The causes and consequences of party polarization have also generated an enormous amount of great scholarship from leading political scientists. So this semester, we are bringing to Williamsburg the authors of six recent and major scholarly books that explore the sources and implications of partisan polarization in the U.S. and internationally. Around 80 students are enrolled in a government department class that is built around this lecture series. The students are reading the six books. During their visits, the authors of these books are delivering public lectures open to the entire W&M community in which they review their main findings and engage in “give-and-take” about their work and the topic of partisan polarization with the students and other guests. Then, at the end of the semester, the students are responsible for integrating what they have learned via 10-12 page analytical essays about the books and the lectures. As part of the experience, we also are providing students with additional opportunities to interact with the visiting scholars, for example, through small breakfasts and other informal meetings. Here’s a comment that one of the visiting scholars recently emailed to me following his session with our students: “I was really impressed with the students. Their questions were far more complex and sophisticated than I would have expected from undergraduates.” No surprise, there. 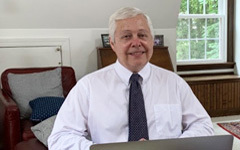 As prospective students and their parents consider college options, I hope that they will weigh the special curricular opportunities that W&M faculty can regularly make available to our undergraduates because of the College’s unique strengths and mission.